And the Derry City boss, who takes his side to the capital once again on Monday night where they face St Patrick's Athletic at Richmond Park, believes they've got to continue to get big results in Dublin if they're to challenge at the top of the table this season. A 2-0 defeat to Shamrock Rovers in Tallaght was followed up by a 1-1 draw against Bohemians at Dalymount - both of those teams currently occupying the top two spots in the SSE Airtricity Premier Division table. However, it was third time lucky in Dublin for Devine's troops as they produced a polished, professional display to clinch a 2-0 victory over UCD in Belfield on Friday night - a second convincing win over the Students this season. With two tough fixtures against Dublin opposition in St Pat's and Shamrock Rovers coming up in the next week, Devine was happy to get three important points on board which saw his side move above Dundalk into third place. "It was a massive three points," said Devine. "It's our first three points in Dublin this year. If we want to do something this year we have to continue to win in Dublin. We go again on Monday to another difficult venue and hopefully we can get something from that." Declan Devine was delighted to secure three points from his latest trip to Dublin. Having needed to dig deep to claw out a late win against north west rivals, Finn Harps last weekend, Devine was pleased to see his side produce a different type of performance to earn a win against an expansive UCD outfit as they restricted the Dubliners to limited goalmouth chances while ensuring they were clinical from set-piece situations which resulted in goals for Greg Sloggett and Darrren Cole. "The players have been outstanding," he continued. "We've won games in different ways. We've been quite free-flowing at the Brandywell and last week in the North West derby we had to dig in and fight for the points. "But tonight I thought we managed the game extremely well. We asked the players during the week can we get some goals from set-pieces and thankfully tonight they did. We also had chances in the game where we maybe could've put a bit of gloss on the scoreline but three points is three points and we're over the moon. "We have been working on it (set-pieces) but Gregg has been unfortunate in that he's had a couple of chances on goal from set-pieces. Going back to the Dundalk game where he had two chances at the Brandywell. One hits Junior and goes over the bar and the other was a goalmouth scramble." 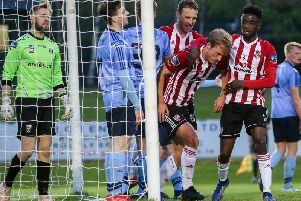 The Derry City supremo reserved special praise for the two goalscorers but felt his entire team played their part in securing a fourth consecutive victory in all competitions. "I'm delighted for Greg Sloggett because he's a fantastic lad and really talented footballer with so much energy and drive. I'm delighted for him. He deserved to score a goal tonight. And Darren Cole, the game is easy for him. He's a Rolls Royce. We're very lucky to have him. "I'm delighted for the two boys but ultimately as a group we're over the moon to come here and win because it's a difficult venue. "It's a brilliant three points and we take it, get on the bus and get back down to Dublin on Monday to see if we can get another three."